Our greatest performances, all in one place! Annalibera *solo* (Des Moines) – Annalibera is a project founded by Nebraskan and classically-trained singer and pianist Anna Gebhardt in 2010. Check her out at Bandcamp for a listen. Listen to this for a feel of her accoustic performance! Christopher the Conquered (Des Moines). – Christopher the Conquered (Chris Ford) has been sitting behind the keys and saying what he can say since he released his debut album I Guess That’s What We’re Dying For… in 2007. Just a man and his piano, his performances are intimate, storytelling, audience-centered, and guaranteed to melt your heart. Held at Manhattan Events. Doors open at 7:30, show at 8. Come in, blow off some pre-finals steam, and party down!! $5 Aquadome t-shirts for sale at the event as well! The Aquadome’s first ever Outdoor Open Mic Night/Jam Session and BBQ Potluck dinner! It’s Valentine’s season again, whether you love it or not. Luckily, The Aquadome has your back no matter what! On the eve of Valentine’s Day (aka Friday the 13th), we are presenting “Sinners or Saints”, a theme party featuring all sorts of folksy talent imported from Columbia, MO. Paper Ceilings is a folk/pop/punk band from CoMo. He sings about his love of dogs and pizza. Dubb Nubb is an indie twin folk band originally from St Louis. Hannah and Delia are two Aquadome regulars and we are excited to have them back this year! Also, their 2013 release “Wild Dreaming” just became available on Spotify. Please bring a $3-$5 donation if possible for the bands. Also, Tru Yo will be open for the night if you want sweet treats! Join The Aquadome for our first show of 2015 featuring our awesome friends from Des Moines Christopher the Conquered and Gloom Balloon! Chris Ford has been sitting behind the keys and saying what he can say since he released his debut album I Guess That’s What We’re Dying For… in 2007. Just a man and his piano, his performances are intimate, storytelling, audience-centered, and guaranteed to melt your heart. Recently, he has toured in Italy for his new album “I’m Giving Up On Rock and Roll”. Gloom Balloon is the debut solo project by Patrick Tape Fleming, the founder of the indie rock band The Poison Control Center. Patrick calls it folk, soul, hip hop, rock n roll, chamber pop, advent-garde, music to make out too, and we agree! Also, music to move your booty to. Bring your dancing shoes for this one. 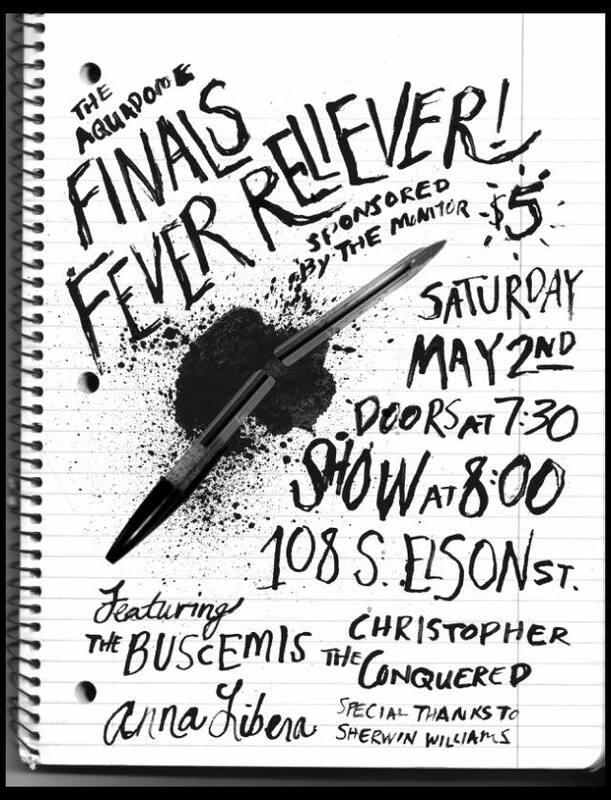 Location will be at 206 E Illinois (the old scrapper’s den), and the location of our last finals fever reliever! On the evening of Saturday the 6th of December, The Aquadome is bringing you the party you need to blow off all that pre-finals steam! As our event poster suggests, this is gonna be a 90s themed show! So come wearing your best flannel, or scrunchie, or overalls! It’s gonna be a good time! THE DREAM OF THE 90s IS ALIVE AT THE AQUADOME! A movie and a show? Yes please! The Aquadome is excited to present a Little Ruckus musical performance along with an exclusive showing of his new film, Wrong Doing, at The Boar’s Head smoking lounge on October 23rd. JUST ADDED: A special performance by Dubb Nubb right after the film! Admission is free, but please consider bringing a donation to go towards the artist’s travel costs! This is the Aquadome’s first ever outdoor concert! Come join us for an evening of local music and a visiting band from Minneapolis! Shout-out to Kathryn Sutton for the awesome poster and banner design! Join us for our first show of the Fall 2014 season! We’re doing this the good ol’ DIY way and having a house show. Music will start at 8 so make sure you get there before then so you don’t miss anything! The show is free but donations for the traveling band would be much appreciated! Gloom Balloon (Des Moines) – Debut solo project of Patrick Tape Fleming (the founder of the indie rock band The Poison Control Center). Patrick calls it folk, soul, hip hop, rock n roll, chamber pop, advent-garde, music to make out too. And we all agree. Did we mention he’s been in Spin? Read the review here! DOLL (KV) – Doll is a dreamy, sultry, electric collective of KV dreamboats. Voted hottest band in Kirksville by a board of certified hottie experts. Professors James Cianciola and Jamie D’Agostino (KV) – The coolest people at Truman who just happen to be professors. Rockstar James Cianciola will be shredding his axe to Poet Laureate Jamie D’Agostino’s spoken word. MC’d by KTRM’s Fox and the Goose, the funniest duo in all of KV. Check out their show every Friday from 3-4 p.m. on KTRM 88.7 The Edge. The amazing Dubb Nubb (Columbia) swung through Kirksville on their “Missouri’s Hat Tour”!!! With them was their good friend Googolplexia (STL) and shared wonderful stories and song! The Tricks – (group of KV goofballs) opened the show. Truman’s stellar stand-up comedy club Up-Chuckles Comedy used their comedic powers to warm up the evening as well as the crowd’s hearts. The lively and ever amusing Tag improv was also there dousing the crowd with laughs. Be sure to check out their new album. Out March 14th! 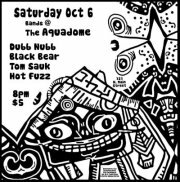 Black Daniels and The Bears (Black Bear): Groove into the deep hours of night with the boys’ first show back at The Aquadome in over 6 months! Blending rootsy vibes and high energy rock’n’roll, their live set is one heck of a party. The Busted String Band: Hailing from Kirksville, Missouri, the Busted String Band is a young and energetic group of musicians that blend their individual musical origins into a sonorous gumbo of roots music.” The Busted String Band creates a groove all their own and are sure to leave you asking for more. Little Bow Beats:HIP HOP VIOLIN duo from TSU. Could change your life with one stroke of the bow. Ambrose Way: This new Kirksville act is quickly proving to be a party favorite. Plan on singing along, ya jackwits! As a DIY venue, The Aquadome is honored to be showing the documentary Dither: The DIY Sound about the do-it-yourself music scene before a solid night of live sounds. You can view the trailer here: http://vimeo.com/67839584. New-to-the-scene-feral-telemarketer-indie-garage-rock-girl-band, The Wonder Drugs, are ready for their first show in KV! Start the night off right with the acoustic stylings of the mysterious and handsome (and mysteriously handsome) honky-tonk lovin’ Dylan Pyles, straight outta Truman State University. Next in this mid-week jamboree of love is the man of progressive soul piano magic, Christopher the Conquered. Lastly (a show for the ages), Songs for a Baroque heart as Des Moine’s own Gloom Balloon performs avant-garde chamber pop music to make out to! Be sure to check out the singles She was the one who got away and The Science of Love Minus Harry Harlow. Part of this cool tour! There’s a reason why Georges Méliès made silent films.Yes, it was because the technology to create synced audio-visual films did not yet exist. BUT ALSO so that 100+ years later, The Aquadome could put on this once in a lifetime event just for you, Kirksville! Come out and watch your favorite bands play to some of the oldest, spookiest, most fantastical films still in existence. These bands will be playing alongside Méliès’ films to create the ultimate supernatural experience. CAN YOU SAY ‘SENSORY OVERLOAD’? Méliès, known as the first cinemagician, was one of the first filmmakers to use such techniques as stop trick and multiple exposures. His films usually involved demons, fairies, ghosts, and aliens, which just happen to be what most of the bands are made up of. Join us for hot tea, scones, and the tiniest sandwich triangles you can imagine. BYO Champagne. Be sure to dress accordingly. Local Indran Fernando has the fastest frets in NEMO. He’s sure to enchant every man, woman, and civilized beast in town. Song subjects include: Reptilian Ancestors, Ghosts, human interaction. Come out and enjoy 3 bands with distinct sounds. Acoustic, 3 piece folk band and prog rock. There’s sure to be something here for you!! Ambrose Way (WEBSTER GROVES, MO)- Rock/Folk/Prog band! OF SEED AND SOIL (Capaldo, KS) – the “one-man folk/blues band in pursuit of spreading love to the world.” Jace Johnson comes from Capaldo, Kansas not only with a banjo on his knee, but also, guitar, harmonica, and a suitcase kick drum. ASHLEY BYRNE – Local artist and genius behind Faux Pas. 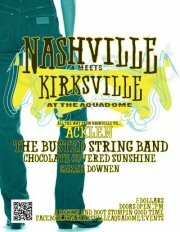 Three long-time friend-bands of the Aquadome are traveling miles from around the midwest just for tonight! The Potluck Show! GET POTLUCKY WITH US! Are you graduating or moving? Don’t want that old coffee table? Can’t get rid of your old books? Donate it to the Aquadome Yard Sale! All the money raised will go right into the Aquadome, helping us stay afloat as a non-profit. We’ve had a really good season and we want to have many, many more! Sunday, May 5: 10:30am – 1pm. Or by appointment. We’ll start accepting donations Thursday, April 18. You can donate by bringing items to our events–both shows and community meetings. If you can’t make it to those or would prefer a different time, just let us know in the comments, message us, or email us at theaquadome@gmail.com. We have truck to move big bulky things, so if you need help, just give us the heads up! The stuff we don’t sell will be donated to local thrift shops or used at a future Aquadome Yard Sale. Note: Please nothing totally busted or disgusting. This is our final show of the season before we retreat into our summer slumber, so we’re going out with loud noise! Come out for a night of rock, punk, post-rock, and post-punk. Get sweaty. Punk rock from dudes who listen to jazz sometimes. Come on out to a super awesome second-to-last show of the Aquadome year featuring……..A POTLUCK!!!!!! At 6pm, your wonderful Aquadome staff will be cooking a variety of tasty treats (soup? chili?!) to share with you, as long as you bring a good dish to share with us! (It’s a Sunday. The dorms are closed and all the restaurants are packed. Come eat with us!) Any type of side dish, entree, desert or anything else edible is welcome. We’ll have plenty of tables set up for a nice community dinner. 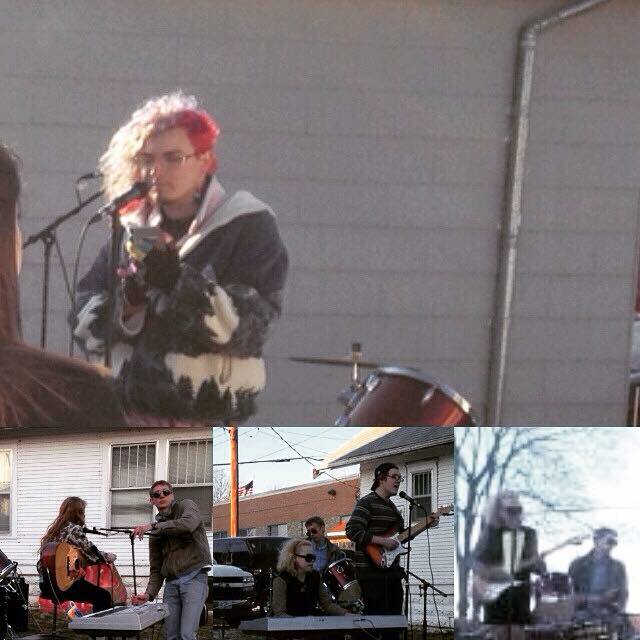 GRBAC – Local jangle-punk rock n roll band making their first debut! Very very cool, new sound. KEVIN SCHLERETH – St. Louis folk-rock native with a whole lotta soul. DOGBRAIN – New, awesome local lo-fi pop rock from the future.You don’t want to miss this. ALL OF THIS FOR JUST $5. SEE YOU THERE. BRING FOOD AND THE FUNK. All of us folks here at The Aquadome know our city is full of unknown talents. So come out and show us what you’ve got! You can play a song, read a poem, perform comedy, juggle, mime, burp the alphabet, or any other talent you may possess. Our past open mic nights have been a blast and we want to continue them every third Thursday of the month. Special Guest MC – Adam1 Leibowitz ! Doors at 7:00pm – show at 7:30. The River Monks (Des Moines, IA) – Folk Rock! Really good, really harmonious folk rock! Not something you’re going to want to miss. Chill Jackson (Kirksville) – Indecisive/gritty rock/blues. Ashley Byrne (Kirksville/St. Louis) – Of Faux Pas fame! Ever Ending Kicks (Anacortes, Washington) – Paul Adam Benson’s looping project. One dude performing chill, simplistic, well-written songs with the ability to carry you off into a trance. Good stuff! Big Fig (Kirksville) – Genre: Rock. They’ll play last. It will be loud. Glass Fields (Kansas City, MO) – Delicious folk music for fans of Kirksville superstars Hannah Copeland and Dylan Moir. $5 / $3 with a donation of stuff like hand soap (please donate hand soap! ), paper towels, toilet paper, cleaning supplies, etc. Bring yourself, your friends, and your special someone to the TRUE LOVE SHOW to get in the spirit for the sweetest time of the year! Not only will those lovely boys, known as MR NASTI and RUNAWAY be here as part of their True Love Tour, but they will also be serving up some great food for all of you crazy fans! Here’s the deal: show up at 6:00 (or a little before) to get in on some good homecooking. Soup made by MR NASTI and some baked goods made by your wonderful Aquadome staff! (It’s a Sunday. The dorms are closed and all the restaurants are packed. Come eat with us at The Aquadome!) 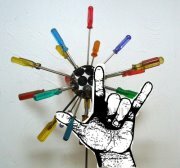 IF YOU BRING A POTLUCK ITEM, YOU WILL BE EXTRA EXTRA COOL! THEN stick around for some awesome electro/dancey/fun tunes! THERE WILL ALSO BE A COSTUME CONTEST! Dress up with a friend or significant other or mom or pet as a famous couple/awesome pair. Be the best dressed and win tickets to an Aquadome event! There will also (also) be a photo area set-up! We will take your picture with your date/friends and upload it to our facebook page so you can remember this terrific night FOREVER! Come boogie with the electro jamz of…! Groudz- (Jefferson City, MO) – Explosive midwestern guitar pop with shoegaze undertones. Vaguely mathy. 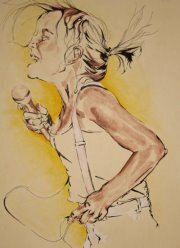 Come check out local folk artists! $5. All proceeds go directly into the Aquadome so we can continue to be a non-profit that supports art, music, and community in Kirksville! The Aquadome is now home to a new PA system and we could not have purchased it without the incredible amount of help from all of you! To celebrate and say thanks, we have a night of FREE MUSIC!!!!! And cheap delicious beer!!! Those who come dressed in beach apparel get an Aqua prize! Don’t miss out.Come celebrate! Whee! Dancey rock with a bluzy guitar and violin! EMD and house music featuring MULTIPLE LIVE DRUMMERS to compliment the jamz. Musicians, comedians, poets, storytellers, anyone with talent, come out to an Aquadome Open Mic Night! No need to sign up ahead of time, just come with a great performance prepared. Share your talents with the wonderful Kirksville community! Feauturing the christening of The Aquadome’s newly purchased PA system. Woah. Come celebrate a new season with new music from around the Midwest! Two bands from Sping Field, MO, one band from Lincoln NE, and your very own Kirksvillian locals TBA. Listen to these links for a taste! 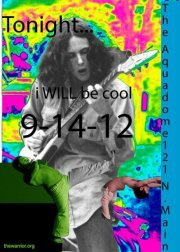 On the evening of Sunday October 14th, The Aquadome will be hosting several bands for your listening pleasure. Acklen – Nashville,TN. Touring in support of their full-length debut “Postcards”. This group of young Nashville gentlemen have a Heartland rock sound likened to that of Tom Petty & the Heartbreakers, Augastana, and Matthew Perryman Jones. The perfect way to kick it before resuming class after midterm break! Tag Improv at The Aquadome! Hey-oh! Tag is pairing up with The Aquadome for the FIRST TIME EVER!! Come this Friday for a FREE night of funny stuff! Invite all of your friends, so we can discover the maximum capacity of The Aquadome! Come see the sights and sounds of what locals have to offer! Free coffee, free entertainment, free time to meet awesome people! Doors at 7:30, Starts at 8pm goes till 10pm. Plenty of time to catch a free show and still go out for the night if you like. Poets, musicians, performers- post on this event to let us know you’ll be there! Dubb Nubb, Black Bear, Tom Sauk, Hot Fuzz! Come and get down on some fantastic music with us on Saturday October 6th at The Aquadome. Come show all yo friendly faces, and we will be sure to have a good time! Come dance to the locals! Toilet paper and cash donations are sincerely appricated! Want to relieve some stress from the first day of classes while listening to great music? Minor Detail and True Men, two fantastic a cappella groups from Truman State, are performing at The Aquadome. Come out and have some fun at The Aquadome on Thursday the 23rd! Welcome 3 eclectic bands all the way from Philadelphia. Opening will be the local Chocolate Covered Sunshine. 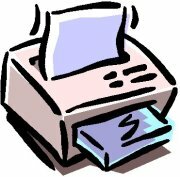 Check out the links below to see the amazing line up you’ll get for only $3. 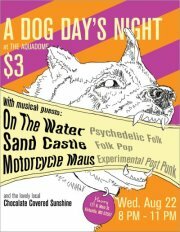 Welcome to the first concert at the Aquadome for it’s new season, and the very last Dog Days of summer! Check. Em. Out. Venture to the newly renovated upstairs of the Aquadome to connect with your beat. 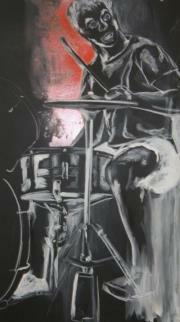 Drums and a beat provided, though some soul, rhythm, and a little dance is suggested. Please grab your djembe, conga, bongo, 5 gallon bucket, triangle, and friend. Get up up and get down. And to help connect to your roots, whatever they may be- free root beer floats provided. Dah dum dah dum dah dum. Be there at 8. Enjoy free brownies, coffee, and entertainment to Kick off the first night of Aqua Fest. Bring your friend, your axe, your poem, your hoola hoop routine, and be ready to meet some amazing people. paint, design, clean, function, build, look BEAUTIFUL, and get some FREE tickets and meet cool people? Come to our work week, July 19th through 26th (Thursday to Thursday) and help out! Feel free to come help any day for any length of time you can listed during the times below. We will be painting, decorating, cleaning and making our creative space look NICE! 4) FOOD all the good things!! Admission: Either a $3 donation, or a BBQ / Picnic item to share! *The show is essentially free, and we prefer you bring food to share- a side, meat, buns, veggie burger. We will purchase hot dogs, and have a grill available to cook only. We can’t afford to get all fancy. -Please do not bring fireworks to set off. We cannot permit fireworks around our commercial space downtown. Freegan, Vegan, Vegetarian, Barbarian, Ovarian? Bring a favorite passing dish if you can, and a friend! Time to get Down AND Dirty at the most amazingest Commnuity Center there be: The Aquadome!!!! East Coat to show the Midwest how the the blues guitar is REALLLY played! The Aquadome is a neighborhood community center reopening in Kirksville. 10 years ago it led the way for DIY culture, including but not limited to: pot lucks and cooking, workshops, live music shows, artist space, social activism, bike rides, and all that good stuff. Saturday, July 30th, we are throwing a grand opening bash. The rot riders, the communiversity garden, the Bike-Coop and the Monitor people will be at the show to share their goals for the community and other information. There will be bands playing live all day and into the night. Also, there will be speakers on various subjects pertaining to our social activism vision (radical culture in kirksville, women’s rights, and possibly queer culture). Please come, listen, eat, drink, and support the center as it gets its feet off the ground! Food Not Bombs Pot Luck!!!! !